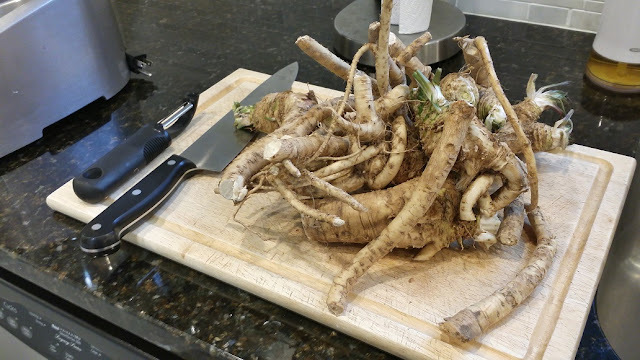 2 years ago, a coworker gave me a horseradish root to plant and I was smitten. 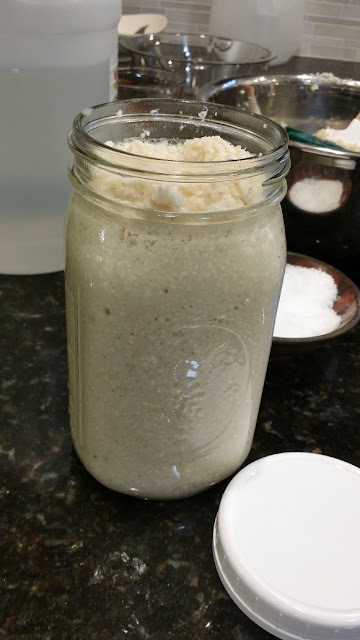 I LOVE horseradish and can never seem to find it hot enough in the grocery store, so when I learned I could actually grow it myself, well it was no surprise for me to give it a try. From what I've read and heard, horseradish is invasive, so you have to be careful where you plant it. So far, I haven't seen that and relish every sprout that's come up. It's pretty easy to grow and so far, that has turned out to be true as well. Fall is when you should harvest it, but really, you can harvest it any time of the year...THAT'S how easy it is to grow. Once you harvest it, clean off the roots/tubers and leave a few behind to grow for next year. Bring in the roots/tubers you want to grind up, break them into manageable chunks, and peel them like carrots. After peeling, cut the chunks into 2-3 inch pieces, throw them into a food processor with a little water and process till grainy, but not too fine. My husband tells me stories of his aunt Leona from Ohio sitting on the front porch shredding horseradish every year with a head full of snot and barely able to see through the tears. I thought, "Surely he is exaggerating," but no...imagine chopping onions, but multiply that times 10. Throw in about 5 lbs. of jalapenos to chop up with the onions and that equals ground horseradish. I had to keep that bowl of ground horseradish and arm's length. Even my always-scrounging cats stayed out of the kitchen! Add some vinegar and a couple of dashes of salt to the ground horseradish and stir. 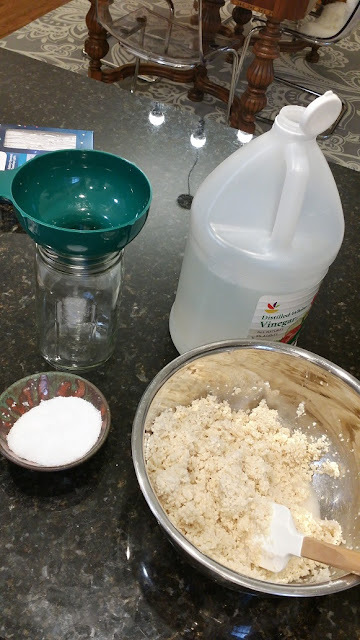 For the amount of ground horseradish I had, I added about 1-1 1/2 cups of vinegar; you want it to be kind of "sloppy" but not too runny. It won't hurt it. Some people add a little sugar to their ground horseradish to help tame the heat a little and I did that as well; about 1/2 tablespoon. Once everything was stirred up, I spooned it into a quart jar, put a lid on it, and put it in the refrigerator. I think we are ALL set for horseradish for a year (at least). I did not taste it because it was waaaaaay too hot; I couldn't even get close. I figured it's a lot like my Chili Paste where it tames down a bit from marinating in the vinegar after a while. Hmmm,...I see a prime rib roast on the horizon for Christmas or a ton of shrimp cocktail!